Musselburgh’s Ian Fyfe did the double in the Lothians Seniors Championship at Newbattle. 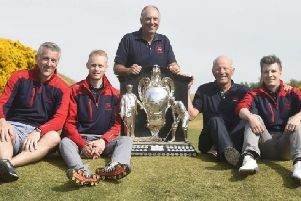 He claimed the R M Lee Trophy by topping the scratch section with a 70, pipping host club member Peter Hardwick and Mortonhall duo Ian Dickson and Duncan Hamilton by a shot. Fyfe also won the Ian MacNiven Quaich with a net 67, beating Hardwick in a countback. West Lothian duo Alex Burnett (Harburn) and David Meldrum (Uphall) topped the handicap sections in the 55-59 and 69 and above age groups.